The OpenShift Container Platform provides a number of features to support Continuous Integration and Continuous Delivery. Aside from its native build and deployment capabilities, OpenShift contains tight integration with the Jenkins Continuous Integration server. Not only can users deploy supported instances within the platform, but they can take advantage of such features such as first class support for the Jenkins "pipeline as code concept" as well as leveraging dynamically allocated slave instances for the execution of Jenkins jobs. A full list of features that are provided by the provided image can be found here. While running the entire Jenkins ecosystem within OpenShift simplifies the configuration and management of a CI environment, many organizations have an existing Jenkins environment which they would like to make use of. This article describes the process for integrating an existing Jenkins instance located outside of the OpenShift cluster with OpenShift to be able to take advantage of many of the Jenkins related features provided by the platform. The majority of the capabilities provided by the integration between OpenShift and Jenkins are made possible through a collection of Jenkins plugins. OpenShift Pipeline - The ability to trigger actions in OpenShift, such as starting a build or deployment. OpenShift Sync - Synchronizing the state of Jenkins jobs and OpenShift objects (BuildConfigs) in order to facilitate integrated pipelines. As of version 0.9.2, the Openshift Sync plugin requires version 1.6.1 of both the Blueocean-commons and Blueocean-rest plugins. Users may have to downgrade the versions of these plugins that come preinstalled with Jenkins. How to do so is beyond the scope of this article. Kubernetes Plugin - The ability to trigger actions in OpenShift, such as starting a build or deployment. 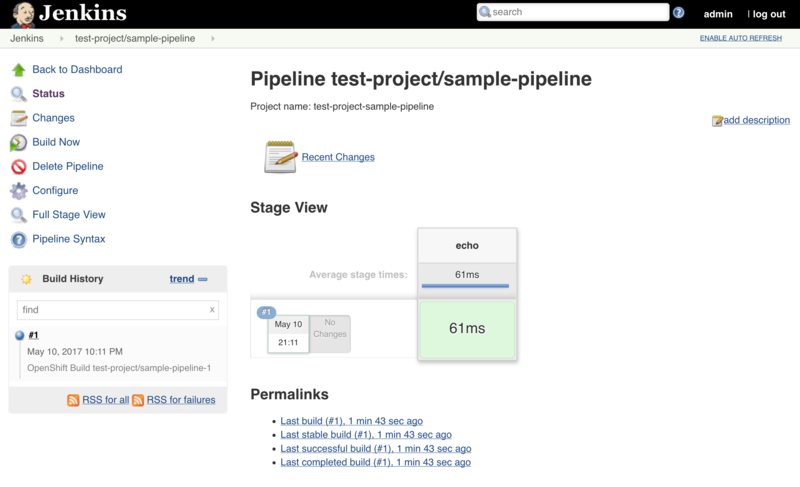 OpenShift Client Plugin - Jenkins Pipeline DSL for interacting with OpenShift. Each of these plugins must be installed within an existing Jenkins instance. As a Jenkins user with administrator access, login to Jenkins and navigate to Manage Jenkins → Plugin Manager. Click on the Available tab and search for the plugins listed above. Check the box next to each of the plugins and when complete, select Download now and install after restart. With the required Jenkins plugins installed, to perform many of the aforementioned actions provided by the plugins, Jenkins must be able to communicate and authenticate against OpenShift. To do so, a service account within OpenShift should be created. A service account in OpenShift makes use of a non-expiring OAuth token which is ideal for situations such as this. Service accounts within OpenShift are scoped to a single project. Even though Jenkins will not be running within OpenShift, it is recommended that a separate project be created to support a separation of duties within the platform and to provide a location to execute dynamic slaves as described in subsequent sections. The project name ci will be used in the examples below, but you are free to select any name you wish. The service account will need to have project level access to each of the projects it will manage The edit role provides a sufficient level of access needed by Jenkins. This command would need to be executed against each project Jenkins needed to access. To simplify the assignment, the service account could be granted rights to access all projects within the OpenShift cluster (known as a cluster role). If a cluster role is chosen, the logged in user must have cluster administrator privileges. The edit cluster role provides sufficient access to manage project resources that is required by jenkins. Since the Jenkins integration with OpenShift makes use of several independent plugins, each has their own type of credential in which they make use of the OAuth token. The OpenShift Token for OpenShift Sync Plugin kind is used by the OpenShift Sync plugin, but the OpenShift OAuth Token kind is used by the Kubernetes Plugin. Create a second credential using the values in the tables below to account for the Kubernetes plugin using a similar process as described above. The Jenkins OpenShift Sync Plugin is responsible for synchronizing the state of BuildConfig API objects in OpenShift and jobs within Jenkins. Whenever a new BuildConfig with a JenkinsPipeline type is created in OpenShift, the contents result in a new job in Jenkins. From the overview page, configure the OpenShift sync plugin within the system configuration page by selecting Manage Jenkins → Configure System. Due to a prior bug, only OpenShift Sync plugin version 0.1.10 or greater allows for multiple namespaces to be monitored. Hit Save to apply the changes. To offload the workload from Jenkins masters, the concepts of slaves was introduced as a way to perform job execution on a set of distributed instances. Since OpenShift provides a set of elastic computing resources, it is ideal for running Jenkins slaves. The Jenkins Kubernetes plugin facilitates the communication between Jenkins and OpenShift along with managing the slave lifecycle. Jenkins slaves running in OpenShift communicate with the Jenkins master using a separate TCP connection. The TCP port to make use of is specified in the Configure Global Security within Jenkins management page. From the Jenkins overview page, select Manage Jenkins → Configure Global Security. Underneath the Enable Security checkbox, locate TCP port for JNLP Agents and select the Fixed radio button. Enter 50000 as the TCP port. The namespace in which slave pods will be created. This value can be overridden by using an inline node configuration within the Jenkins pipeline execution. Select the name of the credential previously configured from the drop down.Clicking Test Credential will verify proper configuration of the OpenShift URL, certificate and credential. The address for JNLP slaves to communicate to the Jenkins master as configured in the JNLP Port section. If entering just the port number, prefix it with a : i.e. (:50000). The Kubernetes Jenkins uses the concept of a pod template that defines the pod that is dynamically created within OpenShift to execute the Jenkins job. As part of the template, an slave image is specified that provides the environment of execution. Red Hat provides several preconfigured Jenkins slaves for use in OpenShift such as Maven and Node.js. A new pod template should be defined for each of the provided images in order to give developers options for running distributed builds in OpenShift. Additional information on the Jenkins slaves provided by OpenShift can be found here. Once all of the values have been defined, click Save to apply the changes. To validate BuildConfig API objects are being synchronized properly, use one of the namespaces that were defined in the OpenShift Sync Plugin section and create a new BuildConfig within this namespace that uses the JenkinsPipeline build type. The example above assumes a Pod Template with the label maven has been defined within Jenkins as a Kubernetes cloud. Using either the sample Jenkins job created in the previous section or another job, perform the following steps to validate slaves are dynamically being utilized. From the Jenkins overview page, select the job that was automatically created. The pipeline can also be viewed within the OpenShift web console by navigating to Builds → Pipelines from within the target project.